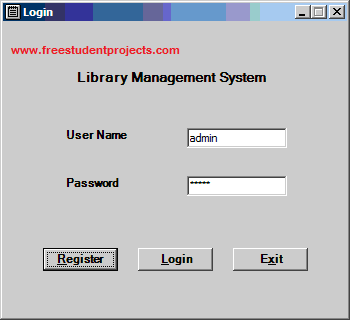 Here we uploaded Library Management System Source Code. Project name is C# Library Management System is developed on latest technology. Library Management Software is capable to manage all the functionalities of a library. The features of Library management system are login, register, add category, add / remove book, search / issue book, return book, etc. This project is developed using C#.NET and Microsoft SQL Server. This is mini project and you have to implement some additional features in this project. Complete project with screenshot explained in this page. 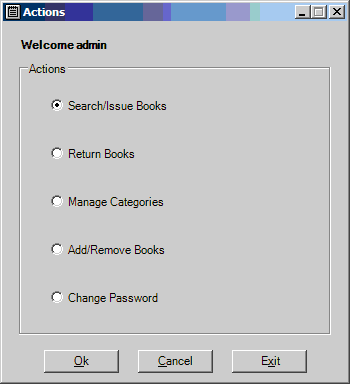 Manage Categories and Add/Remove Books is available for admin user which exists in system after installation. As of now no new user created will be admin. Search/Issue Books screen accessed from actions screen, in this screen search and issue is done. First user enters the criteria for book searching and a book is successfully find than user can select the book he wishes to get issued in grid and get it issued. Books can be removed, all books in system are shown in Remove books section user can use Remove button to remove books after setting Quantity to be removed of book selected.